A front page filled with civic pride. 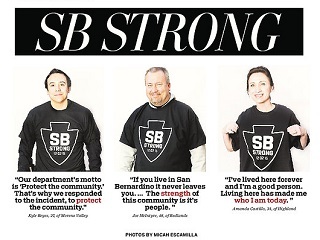 Garcia’s SB Strong logo really hit the big time when it was prominently featured at the vigil at San Manuel Stadium. The Sun has compiled an extensive online section about the attacks. At press time, the site’s most viewed item details the decision of one family of a Dec. 2 terror attack victim to file a $204 million lawsuit against the county.